Stretchtape offers a number of barricade films for numerous industrial purposes. The water-resistant, durable film creates quick entry barriers and can warn of danger or hazards. The film is designed to resist tears and rips and can be used both indoors and outdoors. Stretchtape’s barricade films also offer maximized visibility. Barricade film can be customized including the design, colors, and text for specific needs. Bright red and yellow coloring quickly grabs the attention of any passersby and makes clear boundaries for dangerous or off-limit areas. The film is also flexible, making tying the ends simple and quick to secure to any nearby fixtures. Removal is also just as easy. The heavy-duty film is designed to withstand being nailed or stapled to secure it in place. 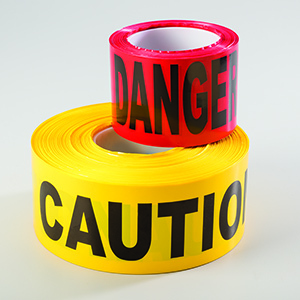 Stretchtape’s most popular stock prints include DANGER, DO NOT ENTER, and CAUTION. However, custom printing options are readily available. Barricade films can be used in work areas, utility industries, or other construction zones to warn of potential hazards.